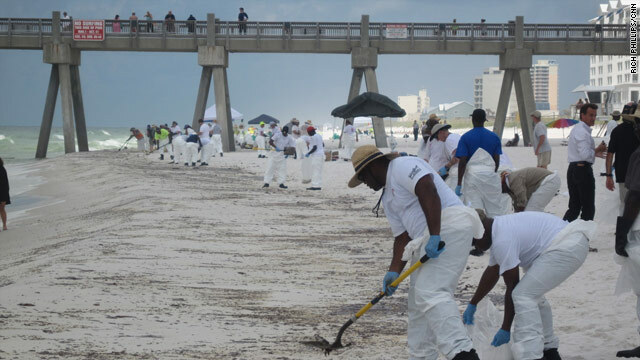 Workers clean a stretch of beach affected by oil in Pensacola Beach, Florida, on Wednesday. Oil has affected sections of Pensacola Beach and Perdido Key beaches, according to the Pensacola Bay Area Convention and Visitors Bureau. Photos from the area showed patches of dark, syrup-like oil on the white sand. Pensacola Beach is open, but the waters from the Park West recreation area to the area just west of Portofino are closed to all swimming and wading until further notice because of large quantities of emulsified oil in shore waters and along the shoreline, the bureau said. The beaches in Fort Walton Beach, Destin and Okaloosa Island are open to the public, and the air quality is good, according to the Emerald Coast Convention and Visitors Bureau, which represents the three destinations. "Depending on the wind direction, tar balls may float ashore in Destin or Ft. Walton Beach later in the week, but cleaning crews are standing by," the bureau's website said. Pebble-sized tar balls have been washing ashore on some beaches of south Walton County. The local health department has also issued a health advisory for the area stretching from the Miramar Beach Access eastward to the end of Topsail Hill State Preserve. All beaches remain open, according to the Walton County Tourist Development Council's website. Dime-size to 5-inch tar balls continue to wash up in widely scattered areas of northwest Florida, but all of the state's beaches remain open, according to Visit Florida, the state's tourism corporation.